The AM4515ZT Dino-Lite Edge features Automatic Magnification Reading (AMR) and delivers higher image quality with a state-of-the-art lens design, providing matchless image quality with stunning sharpness, least aberration, and least vignetting throughout the whole magnification range. Using the included software, the AM4515ZT can detect and display the magnification, and store it with the captured picture automatically, making it especially useful for applications when reading the magnification is not feasible or difficult. 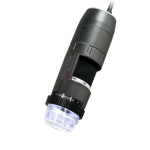 The AMR also brings more accuracy by eliminating the process of visually reading the magnification, while keeping the possibility to be further calibrated. LED Control gives you command of the LED on/off toggle options. The freely adjustable polarizer helps to reveal more detail or to enhance the contrast on the surface by reducing or eliminating the reflections. This model includes the adaptable cap design, a detachable and interchangeable front cap design used in the Dino-Lite Edge series. Different caps have been developed for better adaptability for more applications.